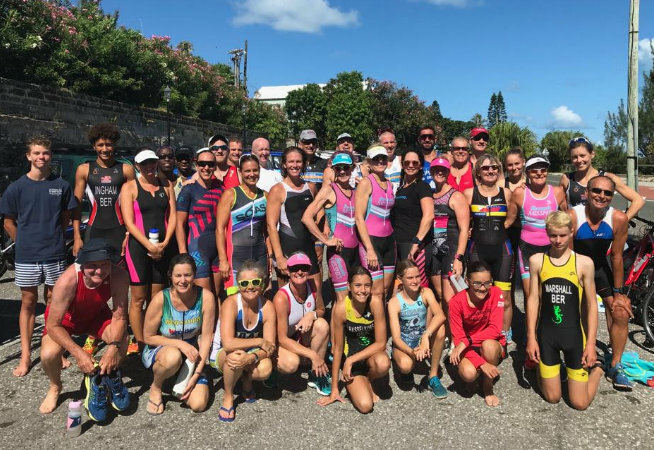 The Bermuda Triathlon Association hosted their Annual Bermuda Hero’s Day Home Triathlon in the Harrington Sound. Geoff Smith and Maddie Durkin were crowned the 2018 Male and Female Champions following and Approximate Sprint Distance 700m Swim, 18K Bike and 4.6K Run. Smith clocked a time of 1:00.54, this after clocking 12.12 on the Swim, 28.54 on the Bike and 19.46 on the Run Course, Will Green was second in 1:07.26, while Teddy Shum was the third Male but 5th overall clocking 1:12.21. Durkin was third overall she was clocked in 1:07.33, she would exit the water in a time of 11.58, she clocked 34.21 on the Bike and 19.48 on the Run, Laura Norman was the second female finisher and 4th overall clocking a time of 1:08.27 and the third Female was Caroline Wright who was 6th overall with a time of 1:14.02.